Since 1902, Milcor has been providing the building products industry with quality items. 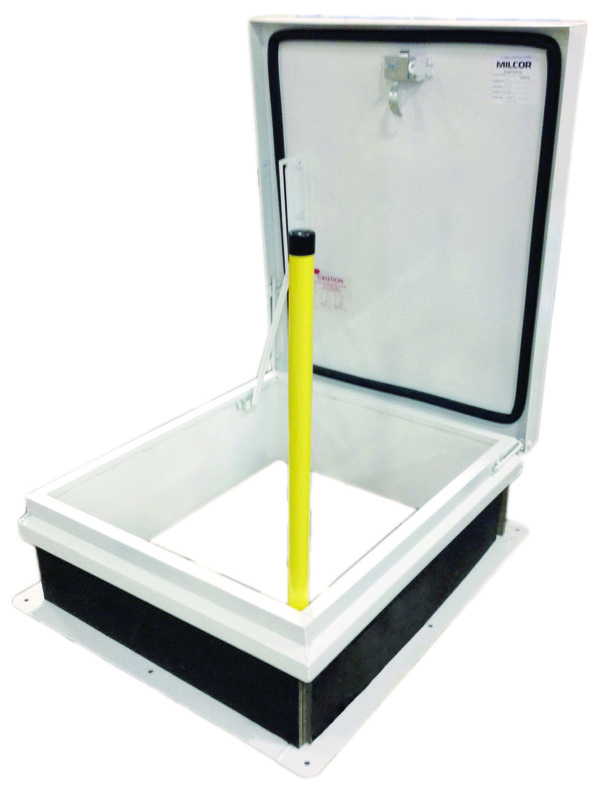 Milcor offers a wide array of access products, including top-of-the-line roof access hatches. The ability to produce custom products to accommodate building owners and architects allows Milcor to be a leader in the industry. Easy, complete and unobstructed opening, superior design placement of hold-open arms and torsion bars or coils. Extruded EPDM seals and secure interior and exterior latches provide a reliable barrier to weather and drafts. Material choices include galvanized steel, aluminium, and stainless steel. Galvanized options are available powder-coated or painted. Hatch covers are insulated for thermal efficiency. High load capacity, 40–70 psf. Available in a complete selection of single and double leaf configurations. Custom fits and modifications are available. Motorized opening is available with remote 3-position selector switches. Cover: covers open easily to 90 degrees. 14 gauge galvanized steel exterior with 22 gauge galvanized steel liner bonded to core of 1” rigid styrofoam insulation. 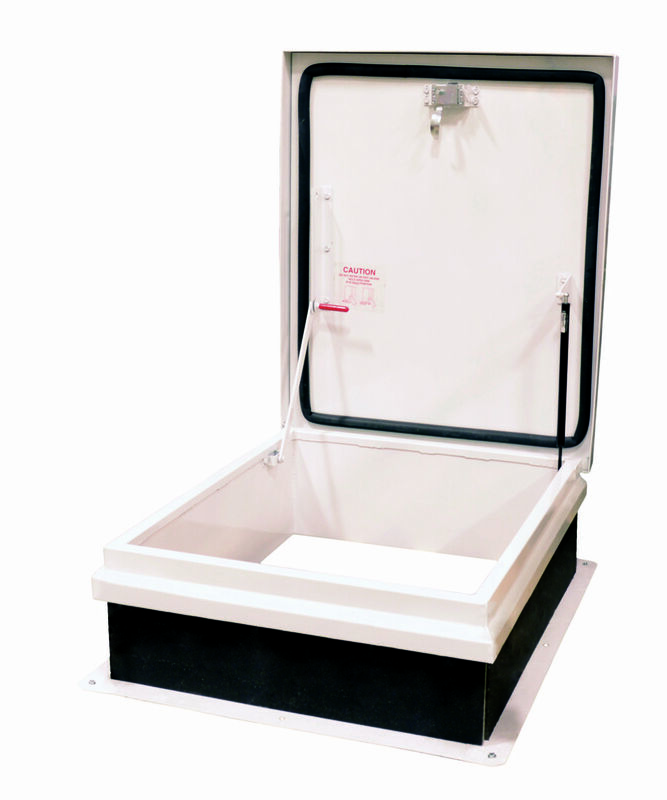 Cover: covers open easily to 90 degrees. RB: High-strength composite panels with 14 gauge galvanized steel exterior with 22 gauge galvanized steel liner with 1” fiberglass insulation. RC & RD: Mill finish .090 aluminum exterior with .063 aluminum liner with 1” fiberglass insulation. 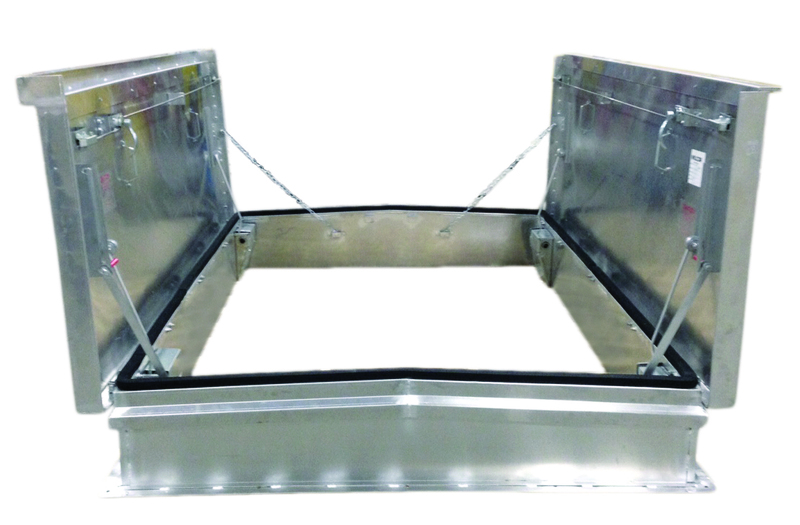 Curb: RB & RC: 14 gauge galvanized steel with a 12” high curb, integral counterflashing, 3-1/2” wide mounting flanges with pre-drilled holes and 1” exterior fiberboard insulation. Latches: Two-point slam latch system for tight, secure closure with interior and exterior handles and padlock hasps. • Telescoping Rails that fit hatch sizes 30" x 30" to 48" x 54"
The Milcor Upright Safety Bar is designed to assist in the safe passage when exiting and entering the roof hatch. 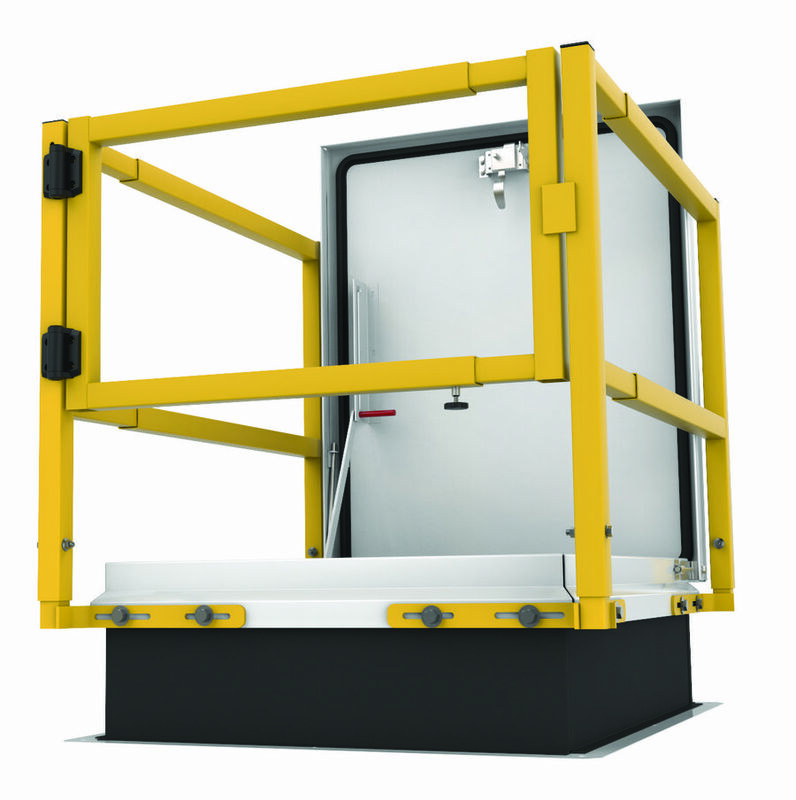 A heavy- duty, hinged steel mechanism allows the upward and downward movement of the bright yellow safety bar. No need to attach bar to center of ladder rungs. 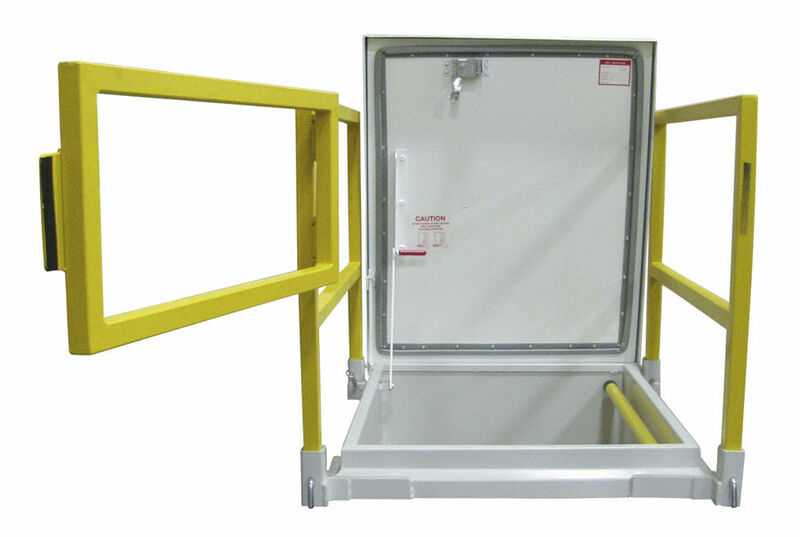 Milcor's Upright Safety Bar has been designed to provide the safest way to exit and enter a roof hatch without restiricting the opening or footing on the top rungs of the ladder.